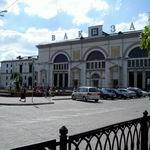 Vitebsk Railway Station – the doors to tourist Vitebsk. In any city you visit, including Vitebsk, the Railway Station Building will be the first to "meet" you on the platform and will open its doors in the old town. 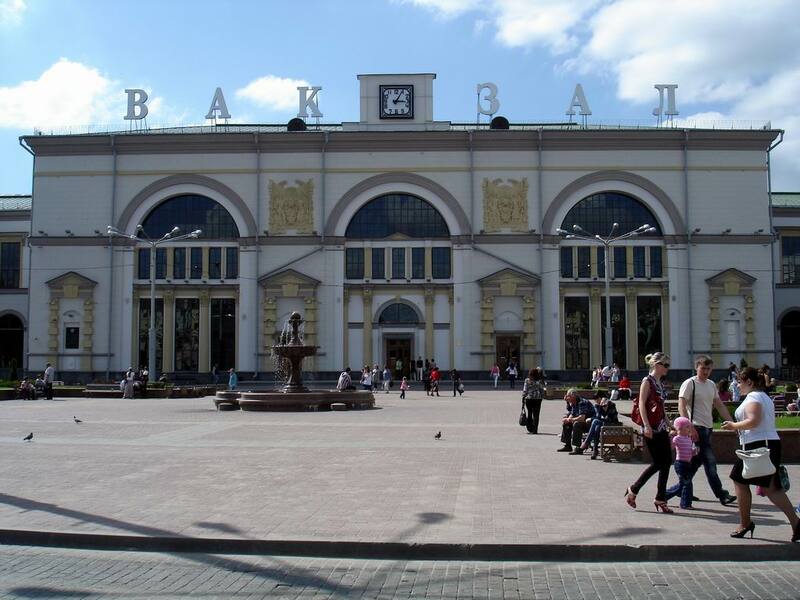 And it doesn`t matter: whether it is on a sunny nice day or at night when the Station Building is brightly lit with coloured lights, for Vitebsk Railway Station you will always be the most beloved and welcome guest! The Railway Station in Vitebsk, as the same-named station, appeared in 1866, due to construction of Vitebsk-Dinaburg (Dinaburg now is Daugavpils) railroad, which passed through our city. After 2 years Vitebsk-Orel branch was fully completed, which extremely pleased grain exporters, because it linked the port of Riga with bread granary of Black Earth region. The war has a cruel rule: it has no mercy on anyone. The architecture of Vitebsk was no exception, and during World War II the Railway Station Building was completely destroyed. It was renovated only in 1952. They engaged famous Soviet architect Boris Kozintsev, who, in addition to Vitebsk Railway Station, designed station buildings in Kharkov, Smolensk and Borodino. In addition, the creator of this Vitebsk sight is also known as the co-author of one of the high-rises on Moscow's Red Square on, so it is no wonder that Vitebsk Railway Station was made a la "Stalin's empire" that affected the architecture of Vitebsk, namely, Kirov Street. Modern building of the Station has two storeys giving the impression that there are two buildings, as the central facade proudly pushed forward, leaving two identical rectangular "brothers" behind. Three spacious arched window openings attract just as the columns on both sides of the entrance with low triangular frontons; and the niches of the outside columns are the repository of memorial slabs reflecting the history of Vitebsk. The bas-reliefs, they are two, reflect the war and only emphasize the monumentality of the building by its scale. In general, we can surely say that if there is any attraction in Vitebsk which could be an example of the Soviet architecture of the 1950s, then it is the Railway Station in Vitebsk. In 2010 Vitebsk Railway Station Building experienced the first large-scale reconstruction. Before this year no major repair work had been carried out. More than half a century, you see, is a reasonable period for the building to get outdated, not only morally, but also technically. The station has undergone not a great change outside, and it would seem that only colours of the building have changed. Before the reconstruction a dark pink colour of the walls together with a dark green of the Station`s roof looked depressingly, and the building looked rather gloomy and stumpy. 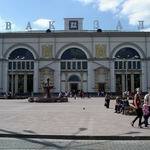 Now the Railway Station in Vitebsk pleases not only citizens but also tourists with its outlook. The builders have used the main efforts to the inside decoration of the Station, greatly changing the interior of the building, from floors and window openings to additional floors. I would mention separately the "intellectual content" of the Railway Station. Information systems and lighting have been improved; automated information terminals and digital display boards were installed on both the Railway Station and the platforms. New panoramic lifts, currently operating only at the Railway Station in Vitebsk, and at the same time, the classic heavy chandeliers, though more modest in their decoration than their predecessors, molded ceilings, marble - all this creates a strong contrast in the interior of the building. Opening the massive wooden doors of the railway station, the first thing you notice is the railway station square which has changed enormously after reconstruction of the Railway Station in the center of the Square a fountain is installed, flower beds with bright flowers are illuminated in the darkness, wooden benches are installed with wrought iron inserts. Near the Square there is a park and just behind it there is one more Vitebsk attraction: the Palace of Creativity of Children and Youth. On our city portal VitebskCity.by you will always find interesting information about the culture of Vitebsk, its architectural structures and historical facts of our city. 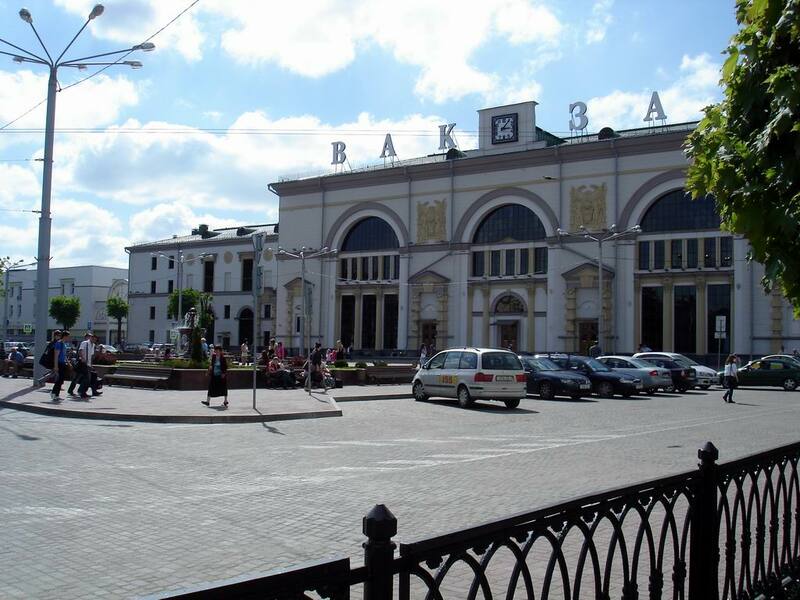 Vitebsk Railway Station is located to the address: 10 Kosmonavtov str., Vitebsk.